Back in the day, model trains were controlled by varying a DC voltage: low voltage made a train go slowly, higher voltage made a train go faster, and reversing the polarity sent it in the opposite direction. Model trains have since entered the modern era, with digital train control or Direct Cab Control (DCC). DCC works by modulating control information into a steady 12-15V applied to the tracks. Individual trains are addressed by their road numbers (the number on the side of the locomotive), so multiple locomotives can be run on the same track, at different speeds or even in different directions. 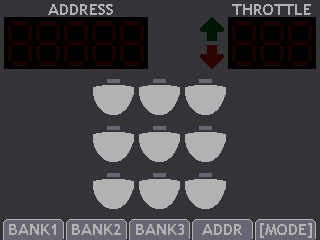 Trains equipped with DCC decoders can also toggle lights and sounds and other features based on DCC commands. However, modern DCC equipment is proprietary and expensive, in the range of $150+ for the equipment to power and control a few trains. 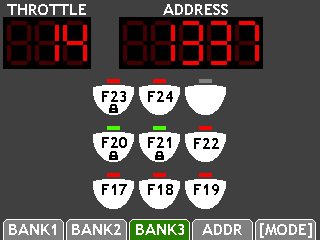 So far, I've been able to control a few features like headlights and set the speed of a locomotive through simple Send(L1) commands on the calculator. I'll add a GitHub link and more information to this topic when I get a chance to work further on this project. Hey, that's really cool! Does the train report back any information, like position or anything like that? No, the protocol is largely one-way. 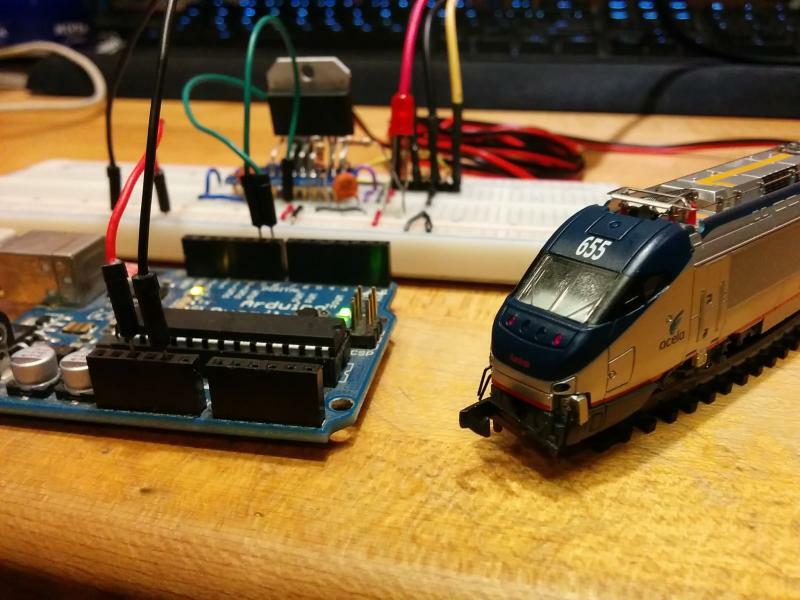 There's an exception: you can program the decoder on-board the train, to set things like how fast the train accelerates, how its lights behave, what its number is, and so on, and you can also read the configuration values back. However, you can have non-train DCC accessories, including occupancy sensors that report when there's a train on a particular section of track. That would be extremely cool. I've long wanted to do something similar with an RCX and Lego 9V trains. Very cool. What's happening on the calculator side? i.e., what format data is being sent to ArTICL? A quick perusal of the repo didn't turn up anything that looked like Basic. You set a list (eg, L1) to one of those four, then use Send(L1) to send the command. Currently the code only supports hard-coded locomotive ID 3. That will change in the future. *bump* I found some more N scale tracks lying around, so I made a quick video of CalcDCC controlling my Kato N scale P42 (minus its shell). I demonstrate setting the speed and direction, sound effects, and the ditch and head/tail lights. Is it possible to have the train report back its current speed, and use that to figure out where it is on the track from a set starting point? Ah, a sort of dead reckoning? You certainly know what speed you set for the train, but each train travels at a different physical speed for each speed setting, and the speed also depends on the slope (grade) of the track and the weight of the train the locomotive is pulling. Dead reckoning would probably yield quite inaccurate results, unfortunately. Put location checkpoints on very small increments on the track, then you will have the train easily tracked on the calculator screen! Good luck! also, it it possible to port this to a monochrome calc? *bump* Geekboy1011 and I have been looking at an implementation of this for World Maker Faire 2017. Geekboy wants to directly bitbang DCC from 15MHz calculators, specifically starting with the TI-84 Plus C Silver Edition. I so far convinced him that we should use an interrupt rather than cycle-counting, so we looked at the relevant spec. "1"-bits must be nominally 58μs in each of two periods, and can be between 52 and 64μs (ie, ±6μs). 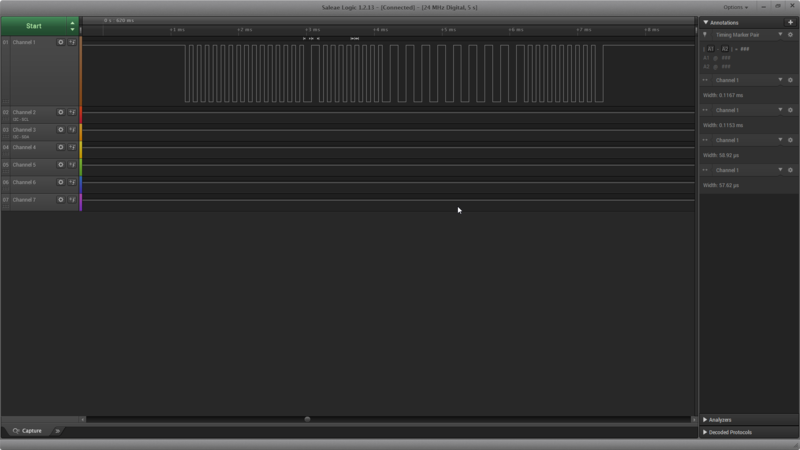 Therefore, if we use the "crystal" timer interrupts with the CPU clock, that's 870 cycles for 58μs. 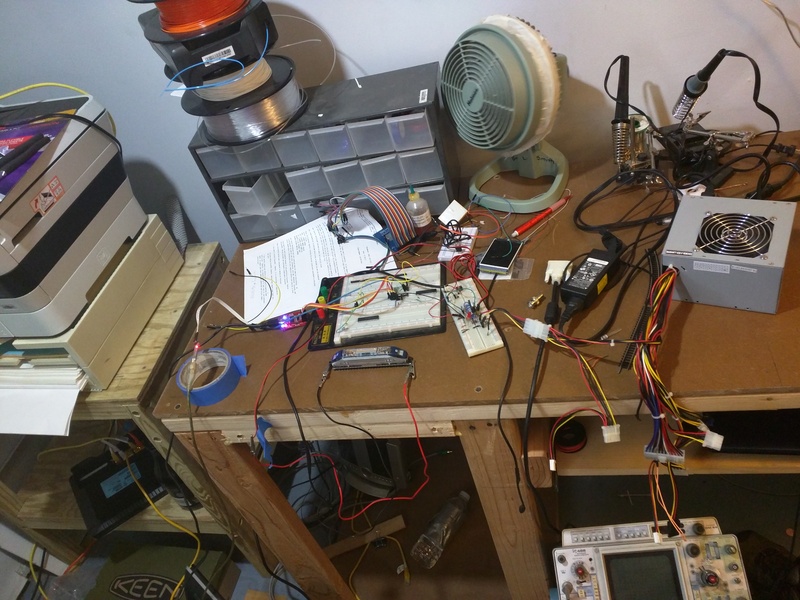 Because we know that the calculator's actual clock speed, based on an RC tank, can vary, I ran the numbers, and anything from 16.73MHz (that's 52μs for 870 cycles) to 13.59MHz (that's 64μs). "0"-bits must be at least 100μs in the first of two periods, and 90-9990μs in the second, so we can just wait two of the 870-count interrupts if we're trying to output a 0 bit. More on this soon! 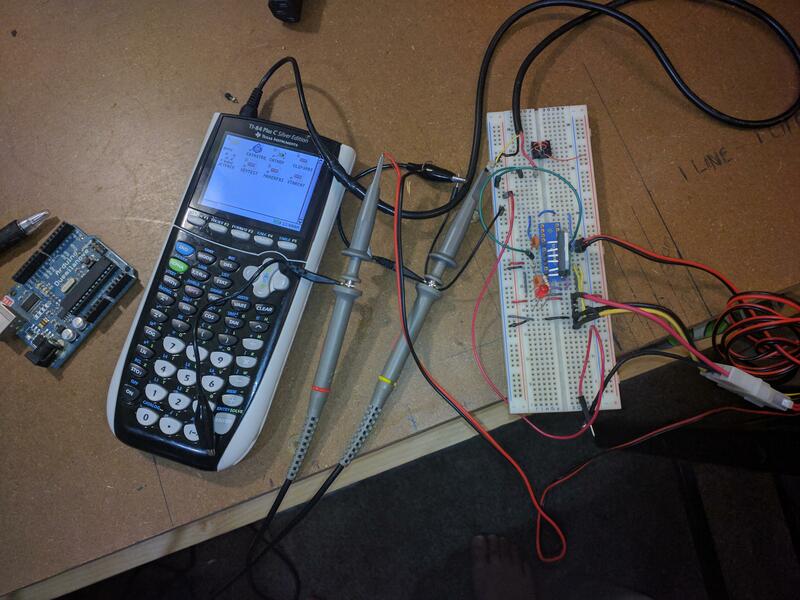 Edit: We used DrDnar's Clock Speed Test program to test Geekboy's TI-84 Plus C Silver Edition. Its 15MHz clock speed is 14.97-14.98MHz, which yields 58.08μs for 870 cycles. Huzzah! So here we have the calculator running a test program we whipped together to see if we can meet the NMRA DCC signaling for sending a 1 bit. Top trace is the LMD18200 AC switching on the rails. The bottom trace is the IO lines of at Ti-84+CSE. To read out that data, we clock in at 58μs/60μs for our 2 periods needed to signal a 1 bit. Which is nicely in our required specification of a nominal 58μs +/-3μs between the high and low phase periods. Do you think we need to support the extended packets described in this pdf https://www.nmra.org/sites/default/files/s-9.2.1_2012_07.pdf They have some nice features, but they are not really necessary at all for this project. I don't think we need to support them right now, but neither do I think we should do anything that would make it difficult to support them later. Right now we've been talking (for the packet-sending code) about just bit-packing the preamble, the data bytes with the stop bits, and the postamble into a buffer, since the bit-sending/byte-sending code doesn't need to know what those bits actually mean. I'd even go so far as saying that for testing, we can just construct a few such buffers manually, so we can focus on testing the bit-sending code first before we add potential bugs in the packet-to-bit code in. We can now send packets! This is an idle packet with a 15bit preamble! It conforms rather nicely to the specification with ~3μs of leeway! What is left to go? We need to finish packet generation on the calculator side. So we can send controls to the model trains. We need to craft a UI for the program that fits the requirements of maker fair! I would also like to make a custom PCB for this for the fair. To ease setup and debugging at the faire, However there was some disagreement(?) about making a custom board instead of something arduino form factor. The arguments being, Community/other people use over a specific module for use with the calculator. On the arduino module, It grants us a known form factor as well as an easy way to interface it with an atmega for the DCC++ base station. It is not hard to tack a 2.5mm headphone jack on it to let it run "standalone"
Doing it standalone does not give us much benefit other then a smaller form factor. Other then that it lets us configure the LMD18200 specifically for use as DCC driver with out question. Where on the arduino it would be a glorified motor driver shield that already exists. So circuitry wise its not much benefit to make it a single non arduino sheild form factor board. The real reason for my want to make it custom is more of a set of personal opinions? I am setting up a board fab/etcher here for small scale boards, Making something in shield form is doable but not worth my effort when I do not use arduinos anyway. I wire in atmegas without the arduino. Less components less cost for me. The second reason is, If people wanted to make this project they could use a normal arduino motor shield wired up just like the DCC++ base station. Jumper the 2.5mm cable to the direction pin and they are done. As well as spend the 22$ on the shield and the cost of the arduino module. It should cost about half to turn and build the smaller form factor board if they decide to follow the project and not use the already commercially viable examples. So to finish this up the other reason this came up, I planned on incorperating the atmega into the form factor of the circuit. I know KermMartian and my self both want to make model train setups at sompoint. And using calculators as controllers is exceptionally fitting. But we would still need a way to program addresses and CV's into our trains, Which like I mentioned earlier the calculator can not support reading of CV's so I would not trust it with writing them due to not being able to confirm them. Which the solution is to have an atmega on board for controlling/programming the trains when the calculator controller is not in use. Or if we wanted to do more fancy layout management with a PC. Geekboy1011 and I were chatting about our projects and I heard him say that he needed a DCC controller front-end, so I thought it would be nice to help him with it. Shouldn't take too long, right? About two days ago, I started sketching on a sheet of notebook paper what I wanted to have the interface look like, then I transferred it to Paint.net to see how it might look an actual screen-sized area. Some things didn't work so I sized them appropriately, added and changed a few more things. I also kept bugging Geekboy1011 about what the interface needs and made changes to it accordingly. I also really wanted that 7-segment display. At the end of that Paint.net workout we got this mockup. Once I got that mockup, I tore it apart for graphical assets, mashed together stuff that was previously used to compress assets in ScoggerCSE and wrote the code needed to get the app to compile something. After that, I copied over some of the graphics routines from SCSE and wrote a few more to deal with full screen rendering as opposed to the half-res rendering routines I had. More coffee-fueled work on the interface renderer until half-past midnight produced the following. The display in a powered-off state. This is an actual screenshot. The color difference can be attributed to the use of the xLIBc palette. Or screenshotting from Wabbitemu. Or both. I don't know yet. Late this morning, Geekboy1011 got me set up with the Github thing and walked me through creating a new branch on the repo without accidentally wrecking everything. I also worked on getting the display lit up based on an internal state and got this. It's lit up with test data. This is also a screenshot. The next step is putting together an event based system so Geekboy1011 can write routines that subscribes to these events (such as pushing or releasing a key on the numpad, pushing some other key, when some other operation completes, etc.) Then after that? I haven't thought that far ahead. Whatever is needed, I suppose. Geekboy1011 wanted me to post the result. This is looking amazing; keep up the good work! I'm thoroughly impressed with the interface, and from what I've been peering at in the backend code, that's also coming along beautifully. More work went into the application's front-end and now I believe I am finished with it. All that is left to do is to have Geekboy1011 finish his back-end and link it to the interface. * Added event loop and made the controller usable. 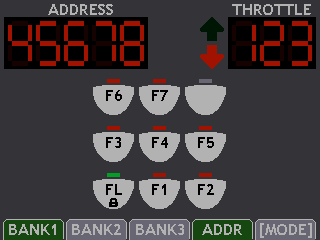 Demonstrated in order: (1) App entry (2) Address input (3) Toggling speed steps and DC mode (4) Entering control mode and messing with throttle (5) A bunch of messing around with function keys and function locking. (6) And bank switching (7) Then back to config for more editing fun and to show a change in speed step (8) And back to control to mess with throttle (9) And finally, I quit. EDIT: The washed out colors in the prior screenshots, as it turns out, was because I forgot to turn the emulator's contrast all the way up. There are 282 users online: 9 members and 273 guests. Members: bobtheferret, GregsAStar, Jeffitus, matkeller19, Pi_Runner, readroof2, TimmyTurner62. © Copyright 2000-2019 Cemetech & Christopher Mitchell :: Page Execution Time: 0.246850 seconds.